SOTI MobiControl is an Enterprise Mobility Management solution for protecting and managing Apple, iOS, Windows and Android devices - Go4Mobility has been a specialist partner of SOTI MobiControl in the Benelux for 10 years and therefore provides absolute added value in implementing SOTI in your business environment.Unified Endpoint ManagementSOTI MobiControl manages all stages of mobile device deployment to provide seamless enterprise mobility management. SOTI MobiControl is an Enterprise Mobility Management solution for protecting and managing Apple, iOS, Windows and Android devices - Go4Mobility has been a specialist partner of SOTI MobiControl in the Benelux for 10 years and therefore provides absolute added value in implementing SOTI in your business environment. Enterprise mobility is a complex management challenge. A combination of purpose-built devices, corporate-liable smartphones, tablets, BYOD and smart peripherals is necessary to drive productivity and business growth, however, can be difficult to manage with point solutions. SOTI unifies mobility management from a single management console, removing the complexity from managing a multi-OS, multi-vendor, and multi-purpose mobile ecosystem. 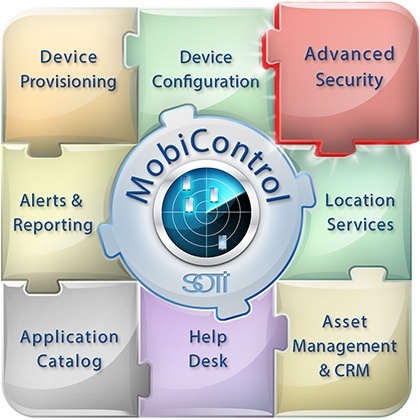 SOTI MobiControl is a unified enterprise mobility solution that provides the ability to manage mobile devices, applications, content, email, and security within an enhanced, secure, all-in-one offering. With the deployment of consumer smartphones and tablets into corporate- liable, BYOD and CYOD programs and peripherals, enforcing security policies and best practices while supporting diverse user requirements can be a tough balancing act. SOTI unifies mobility management from a single management console, removing the complexity from managing a multi-OS, multi-vendor, and multi-purpose mobile ecosystem. A successful mobility deployment requires an efficient and succinct process to rollout mission-critical line-of- business devices. Utilizing MobiControl Stage to load and test the most up-to-date setup will reduce ship-back costs and ‘time out-of-service’ for mobile devices in the field. Reduced time for device provisioning will get employees productive sooner. Safeguarding the enterprise from potential threats while maintaining an enjoyable user experience can be a major challenge to effectively manage and grow your organization. SOTI MobiControl’s best in-class authentication, certificate management and data encryption provide enterprise IT departments with peace-of-mind that their devices and data are never compromised. Secure web browsing and real-time malware scanning protect enterprise networks from internal and external threats. information, location and active policies. Mobile device users get a best- in-class experience when accessing corporate content, applications and messages all within one easy to navigate application. Applications are at the center of every enterprise’s mobility strategy. Secure access to line of business applications gives employees the tools they need to be more productive and allows enterprises to realize the full potential of a mobile workforce. SOTI MobiControl helps you get the right applications to your mobile workforce in a fast, secure and scalable manner. Application Catalog gives users a one-stop shopping experience for corporate approved apps. Enterprises looking for more granular control over corporate-liable devices have the added lexibility to silently install mandatory applications. Robust whitelist and blacklist policies provide an extra layer of security across your deployment. Mobile email management is more than just providing mobile access to your corporate Exchange server. Enterprises must ensure sensitive corporate data stays behind the firewall. With SOTI MobiControl, administrators can create email sharing and forwarding policies to protect against data leakage and inadvertent disclosure of sensitive company information. Comprehensive Exchange Access Controls prevent unmanaged devices from accessing the corporate Exchange server. Take the Burden off of IT - Deliver seamless enrolment with over-the-air device configurations for email, WiFi, VPN etc. at a granular level based on various criteria including device properties, custom attributes/data and more. This takes the burden off IT as users can now enroll their own devices quickly with zero IT intervention. manage device profiles and manage new devices remotely. Strategic Management Insights - The SOTI MobiControl management console can be used to generate an extensive catalog of standard and custom reports on key areas of your enterprise mobility environment. High level or granular analytics can be automated and pre-scheduled to monitor numerous parameters over a specified time period. Reports can be generated and exported in all major file formats. Live, Real-Time Support - SOTI MobiControl’s Remote Control is the fastest and most reliable interactive remote control of Android and Windows devices for optimal helpdesk capability and troubleshooting. Remote view and advanced device management is available for iOS devices. These best-in-class remote helpdesk capabilities offer administrators the ability to support their growing mobile workforce effortlessly. Always Available and On-Demand - SOTI MobiControl is robust and reliable at any scale of deployment. Leveraging deep domain expertise with thousands of customers globally in all major vertical and niche markets. SOTI also provides enterprises with flexibility to deploy the solution as an On-Premise solution or in the MobiControl Cloud. incidents. Administrators can identify when a device is compromised and take immediate action to safeguard their corporate data. Enterprise Complexity Eliminated - SOTI MobiControl provides stronger security and compliance with corporate and regulatory policies to apply same policies across multiple OSs and endpoints. The centralized, web-based management console provides total visibility and full control of your corporate, shared and personally-owned mobile devices. “Manage Your Own Device” for Reduced IT Workload - SOTI MobiControl’s MYOD (Manage Your Own Device) self-service portal equips device users with tools to manage their mobile devices, thereby, reducing IT support costs and increasing productivity. Users can reset passwords, wipe data or lock a misplaced, lost or stolen device, locate device via geo-tracking, gain visibility into their apps and much more. You can Put your trust in SOTI to provide best-in-class Secure Enterprise Mobilty Management.